For years, researchers have been examining how microbes help us stay healthy through exercise. Over this time, several mechanisms have been identified and shared across the scientific literature spectrum. While beneficial to scientists, this scattered route has not been particularly helpful to most Canadians. Female Runner jumping into the new Year 2017 and leaving 2016 behind. It's 2017 and many Canadians are starting the New Year with a list of resolutions to change certain aspects of their lives. At the top of many personal promises is the intent to get more exercise. 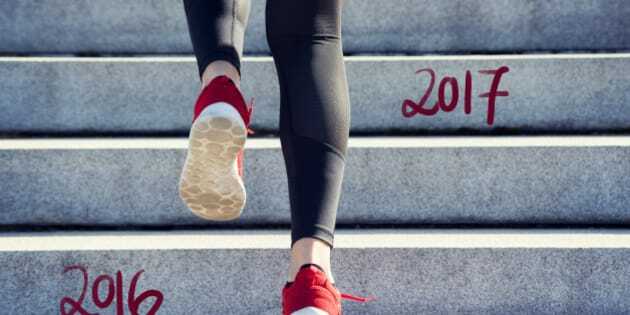 Whether this means a gym membership or the purchase of a brand new pair of sneakers, the ultimate goal is the same; people want to improve their health. There is little doubt exercise is good for the body. Even the government has offered guidelines for physical activity. Every Canadian now can understand how getting the body moving can be good for the muscles, and the mind. But the human component of exercise only represents a fraction of the actual cellular makeup of each person. The majority of cells are microbial in nature. Unfortunately, there are no guidelines to take care of the trillions of microorganisms inhabiting us. The good news is that for the most part, exercise is beneficial for your microbes. Research examining both animal models and humans has revealed exercise promotes diversity and also helps to keep many species known to cause inflammation at bay. For this reason alone, keeping active is a way to keep your microbial population healthy. But this isn't the only microbial reason for exercising. It turns out microbes also give back to us when we engage in physical activity. For years, researchers have been examining how microbes help us stay healthy through exercise. Over this time, several mechanisms have been identified and shared across the scientific literature spectrum. While beneficial to scientists, this scattered route has not been particularly helpful to most Canadians. Now that has changed thanks to an international duo of researchers. They have explored the academic realm to learn of these benefits. Their efforts to understand the microbial paybacks have been compiled and are now available for everyone to appreciate. The team examined three specific feedbacks, namely, hormones, gut health, and mental health. In each section, research from both animal models and human trials were collected in the hopes of finding common results. From there, the team developed a set of guidelines to ensure the best microbial outcome. On the hormonal level, microbes are known to react to several chemicals released by the body to deal with the stress encountered during exercise. Certain microbial species have the ability to counter the effects of stress on the body, helping it to relax and possibly heal faster. In addition, dozens of species are known to alter the production of a variety of positive and calming neurotransmitters such as serotonin, dopamine, and GABA. Some of the more beneficial strains even produce these molecules. The end result is a calmer individual with a greater potential for healing. As for gut health, many people who exercise tend to have a loosening of the intestines leading to some unexpected - and unwanted - rushes to the toilet. This happens as a consequence of the inflammation occurring during exercise. The intestinal barrier opens up and fluid is allowed to pass freely. To counter this, certain types such as the probiotic Lactobacillus and Bifidobacterium have the ability to balance out the inflammatory response and keep those openings to a minimum. This effect can be enhanced through the ingestion of dietary fibres including prebiotics. This way, a person can keep running without worrying about having the runs. The final and perhaps most important benefit is located not in the gut but in the mind. Many of the hormones involved in exercise also play a role in other aspects of mental health, including fatigue, insomnia, and depression. These symptoms are a common reason behind many people giving up on their resolution to exercise more. At the molecular level, the troubles are primarily associated with unbalanced levels of serotonin in the brain. Thankfully, certain microbes in the gut may help to balance out serotonin such that there are fewer highs and lows. This can reduce mental fatigue and improve proper sleep patterns. In addition, many strains also help to reduce inflammation, which is known to be involved in depression. With this information in hand, the authors could then develop a list of the most beneficial bacteria and a list of dietary recommendations to keep them in high enough numbers in the gut. They recommended significant amounts of fibre with lower amounts of simple sugars, high levels of polyunsaturated fats such as omega-3 fatty acids, and high amounts of fruits and vegetables. As for the one food type everyone discusses during exercise training -- protein -- the authors suggested no more than about 100 grams per day for the average person. If any of this sounds familiar, it is because these recommendations bear a striking similarity to an already well-known style of eating, the Mediterranean Diet. Regardless of whether exercise is on your resolution list or it is a part of your everyday activity schedule, the results of this review demonstrate the need to think about your microbes as well as your muscles. Granted each of us is unique in our microbial makeup and will react differently to the effects of exercise. However, the general guidelines may help to ensure the microbes are doing what they can to improve the effects of exercise and keep you healthy throughout the year.